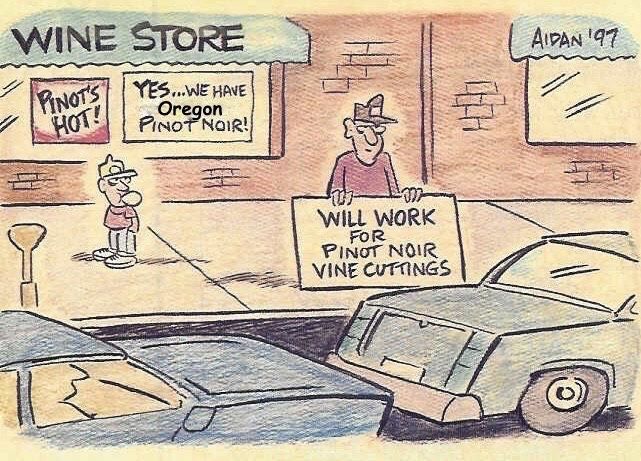 Consumers and sommeliers are infatuated with Oregon Pinot Noir! Long considered a world-class wine region, but catching on even more with the wine cognoscenti, Oregon has seen unprecedented growth of late and now has more than 1,000 vineyards, more than 700 wineries, and grows 72 grape varieties. Full Glass Research released the newest economic impact figures in March 2018. The figures show all economic activity in Oregon related directly or indirectly to wine is $5.61 billion, compared to $3.35 billion just three years ago, an increase of 67% in statewide impact. The number of wine-related and induced jobs in Oregon totaled 29,738, up from 17,099 in 2013, representing a 74% increase. Wine sales grew 17% and Oregon is a major growth leader, percentage wise ahead of all other major growing states and countries around the world. Compared to the 2013 data, wine grape acreage increased 27%, and tons crushed by 42%. Oregon wineries bottled over 3 million 9L cases of wine and had revenues of over $529 million in 2016 (compared to $363 million in 2013) from the sale of packaged wine. Wine exported outside of Oregon increased from 127 million to 196 million, an increase of 53%. Consumers pay on average $39 a bottle for Oregon wine purchased through direct sales according to Ship Compliant data. Oregon wines sell well even though they are priced a little higher on average than wines from other US regions. Wines sold Direct-to-Consumer (DtC) increased 45% from 197 million to 286 million since 2013. Oregon wineries sold 23% of their bottled wine DtC. 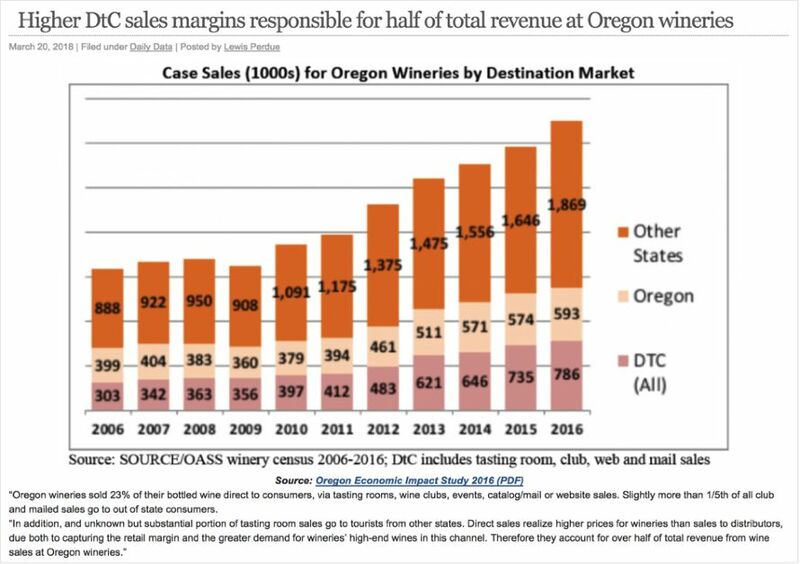 Case sales for Oregon wineries by destination is showing in the graph below. Don Hagge of VIDON Vineyard, (featured in this issue), created VinAlliance, an association of consumers and wineries for DtC sales with the benefits of traditional wine clubs. The program is in development. Visit www.shopvinalliance.com. The star in Oregon is Pinot Noir where demand continues to grow at an average of 8% a year since 2013, compared to an average of 2% for the wine market as a whole. Rising quality of Oregon Chardonnay and the emergence of Southern Oregon and the Columbia Gorge are also increasing Oregon’s visibility in the market. Since the 2013 report, growth and investment in the Oregon wine industry has expanded with a net increase of 6,480 planted acres, and the number of wineries increased by at least 120. Still, 85% of Oregon wineries produce less than 5,000 cases. Social media references to Oregon wine are more complimentary compared to references to the wine industry in general. Higher-quality Oregon wine continues to show increasing sales. Speakers at this year’s Oregon Wine Symposium emphasized that Oregon should not become complacent and should concentrate on effective national marketing and continue to focus on tourism. Tasting room sales have fallen in other popular US wine region destinations but has held up so far in Oregon despite the fact that they are at the mercy of the terrible, rainy weather in in Willamette Valley in the winter. In other Oregon news, Oregon is in the process of obtaining approval for more sub-appellations within the Willamette Valley AVA, including the proposed Van Duzer Corridor, Tualatin Hills, Mount Pisgah and Lauralwood AVAs. A move is afoot, however, to preserve the value of the more well-known Willamette Valley name, and vintners are encouraged to include Willamette Valley as well as the sub-AVA of origin for each wine. David Adelsheim is planning to submit a truth in labeling law to the Oregon legislature that will require any Pinot Noir or Chardonnay bearing the Willamette Valley designation be made 100% with grapes from the AVA. According to a report from the North Bay Business Journal published online on April 26, 2018, at http://www.northbaybusinessjournal.com/northbay/sonomacounty/8205085-181/sonoma-napa-californiaoregon- wine, there are still thousands of acres of plantable land in the Willamette Valley AVA. Some of the smaller sub-AVAs, such as the Dundee Hills, are beginning to fill up, but there is still a number of acres left in the Chehalem Mountains, Yamhill-Carlton and Eola-Amity Hills AVAs. There are thousands of acres available in Folk County. A significant number of smaller vineyards with older vines are self-footed and either infected with phylloxera or at risk for phylloxera. There are few restrictions on new vineyard development, and it is fairly easy to get a permit for a winery and a tasting room on a property. Read more in the Oregon Wine Press: www.oregonwinepress.com/on-the-up-and-up.